At CMI Toyota, we do more than just provide people with jobs. We offer people an exciting career within a diverse, fast-moving company that is proud to foster a work environment that encourages creativity, teamwork and innovation. This is a company philosophy that is primarily supported by our strong leadership, high ethical standards and passion for safety. 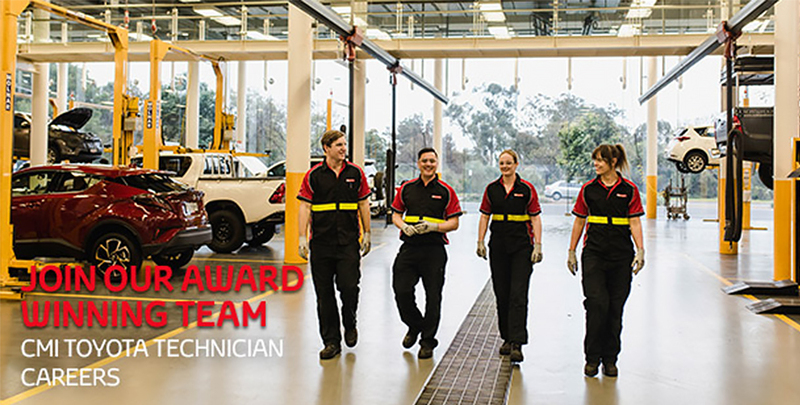 CMI Toyota is always seeking dedicated people who are interested in a career as a service technician in the extensive CMI Service Department. CMI Toyota services all makes and models of vehicles and although Toyota or franchise experience is desirable, it is not essential. 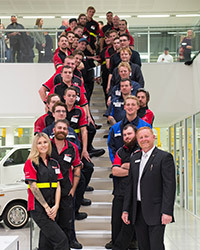 Each year CMI Toyota employs a number of highly motivated individuals to take part in an intensive fast-track Automotive Apprenticeship Scheme. The program is conducted at a purpose built training centre and overseen by CMI Toyota’s Technical Training Manager. "I started this program knowing I could finish my apprenticeship early. That’s not the only great aspect - a training centre is also provided that allowed me to focus on my training even more. It's fantastic and I wouldn’t change it for anything else." "Being a girl, I didn’t think that I would be able to get into the industry, but with CMI Toyota I was given the opportunity to follow my dreams. We get all the help we need to become a highly skilled technician, while working with all the latest technology in a clean, organised and friendly environment."